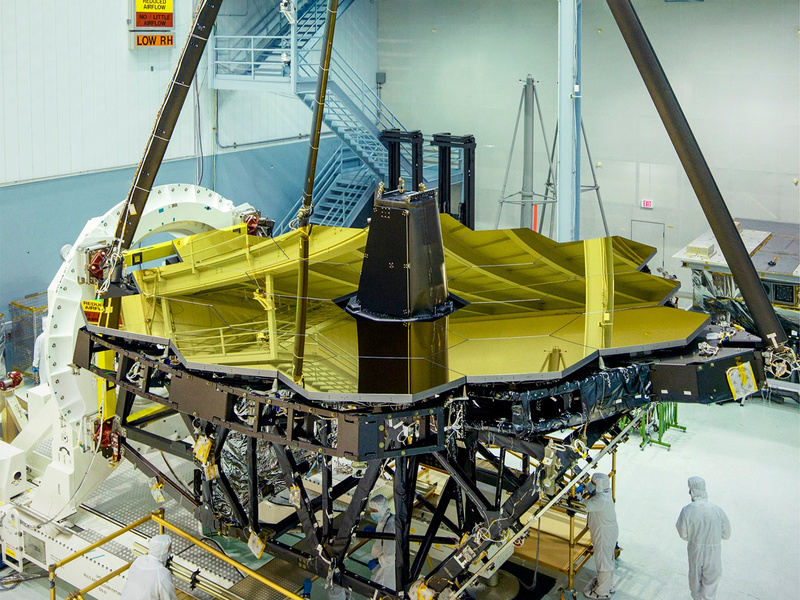 On 27 April 2016, engineers unveiled the giant golden mirror of NASA’s James Webb Space Telescope as part of the integration and testing of the infrared telescope at NASA’s Goddard Space Flight Center, Greenbelt, Maryland. Click the image for a full-size version. Image credits: NASA/Chris Gunn. The 18 mirrors that make up the primary mirror were individually protected with a black covers when they were assembled on the telescope structure. Now, for the first time since the primary mirror was completed, the covers have been lifted. Scientists from around the world will use this unique observatory to capture images and spectra of not only the first galaxies to appear in the early universe over 13.5 billion years ago, but also the full range of astronomical sources such as star forming nebulae, exoplanets, and even moons and planets within our own solar system. To ensure the mirror is both strong and light, the team made the mirrors out of beryllium. Each mirror segment is about the size of a coffee table and weighs approximately 20 kilograms (46 pounds). A very fine film of vaporised gold coats each segment to improve the mirror’s reflection of infrared light. The fully assembled mirror is larger than any rocket so the two sides of it fold up. Behind each mirror are several motors so that the team can focus the telescope out in space. 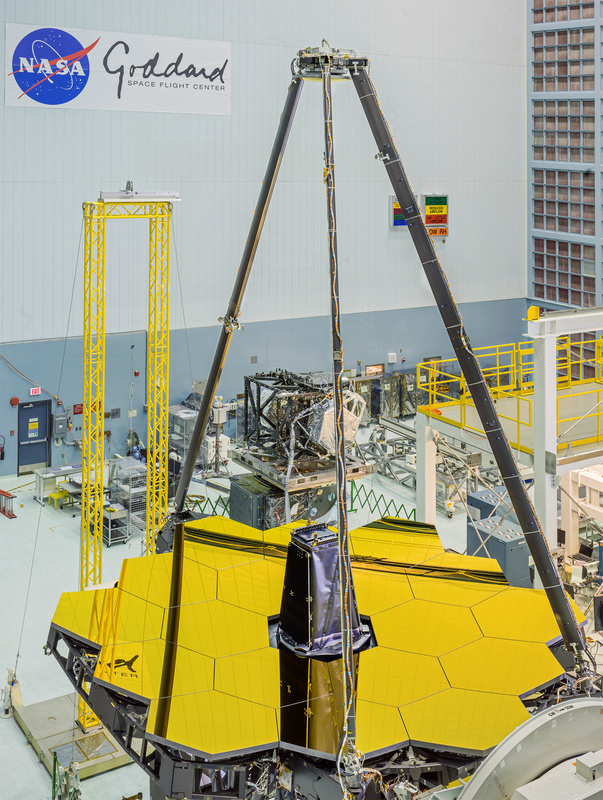 Standing tall and glimmering gold inside NASA’s Goddard Space Flight Center’s clean room in Greenbelt, Maryland is the James Webb Space Telescope primary mirror. With an aperture of 6.5 metres, it will be the largest yet sent into space. Image credits: NASA/Chris Gunn. The James Webb Space Telescope is the scientific successor to NASA’s Hubble Space Telescope. 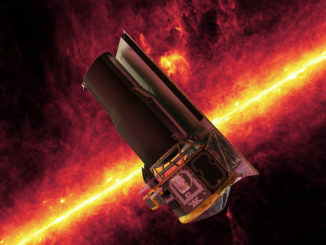 It will be the most powerful space telescope ever built. Webb is targeted to launch from French Guiana aboard an Ariane 5 rocket in 2018. 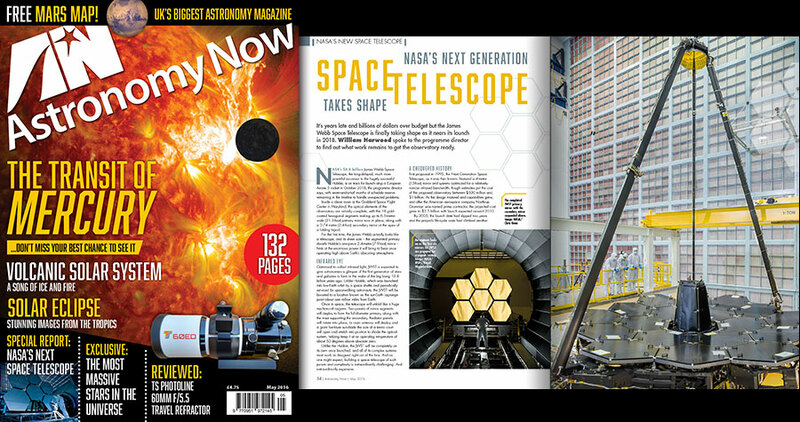 Find out more about the final preparations now underway for the launch of the James Webb Space Telescope in a special report in the May 2016 issue of Astronomy Now. 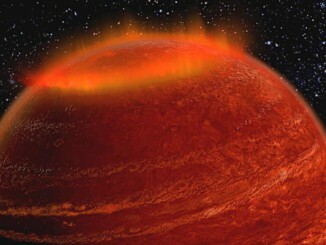 The Sun’s magnetic field is responsible for everything from the solar explosions that cause space weather on Earth — such as aurorae — to the interplanetary magnetic field and radiation through which our spacecraft journeying around the solar system must travel. 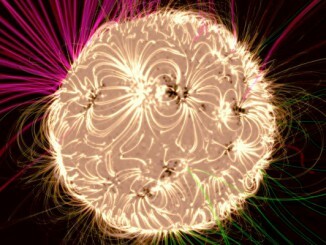 But even now, scientists are not sure exactly where in the Sun the magnetic field is created.